IRONWEAR®'s New Jr. Speed Suit™ comes complete with a black mesh Jr. Speed Vest™ and matching black mesh Speed Pants™ and black mesh Speed Shoe Irons™. The New Jr. Speed Suit™ Complete is the ultimate training tool developed to help athletes run faster, jump higher, and play longer. The New Jr. Speed Suit™ Complete is the ultimate training tool developed to last for years of training and is able to continue to help athletes reach their next performance level. Each part of the Jr. Speed Suit™ Complete is fully weight adjustable so that the athlete can start with a low amount of weight and slowly move up as their strength, speed, and endurance increases. The size of the Jr. Speed Suit™ is fully adjustable and will continue to fit the athlete as they grow. The Jr. Speed Suit™ adjusts easily to fit athletes from just under 100 pounds to over 250 pounds. The Jr. Speed Suit™ is extremely thin and flexible and can be worn on top or under most clothing or sweats so it is good for training in all seasons. 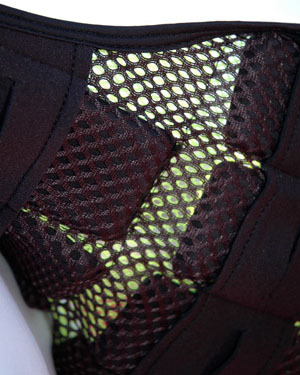 The mesh allows air to flow through the vest to help keep the athlete cooler so they can workout harder. The Jr. Speed Suit™ allows the desired weight to be evenly distributed over the athlete's body without interfering with their movements. The shells and weights themselves conform to the body and bend with the athlete as they move so the vest stays in place during rigorous exercise. The Jr. Speed Suit™ has IRONWEAR®'s padded proprietary oversized stretch strapping system and double lock belts. 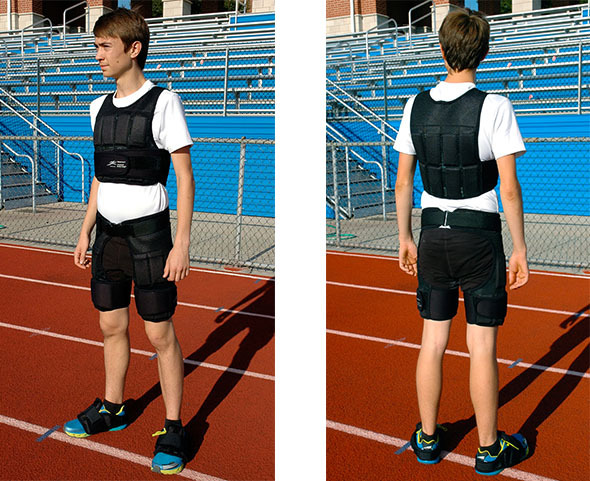 The system stretches to allow the athlete to breath and move properly while the double lock locks all the edges of the shells and holds all parts of the vest and lands from moving against the athlete's body. The Jr. Speed Suit™ is easy to maintain and can be hosed off, hand washed, or machine washed with the weights removed. After washing the Jr. Speed Suit™ should be air dried, the shells porous design allows them to dry very quickly. The Jr. Speed Suit™ includes IRONWEAR®'s Jr. 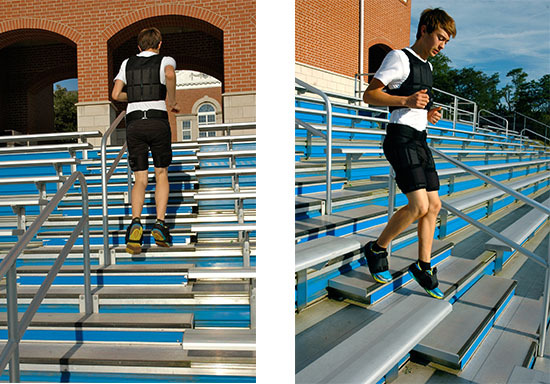 Speed Vest™ adjustable from 1 to 9 pounds, the vest vest for all types of young athletes. The Jr. Speed Vest™ is designed for all types of intense training including running and jumping without interfering with upper body or arm movement. The unique thin padded shoulder strap allows for complete range of motion and are great for playing basketball or volleyball. The Jr. Speed Vest™ fits slimmer torsos than the standard Speed Vest™ but still adjusts over a wide range from 17 to 50 inches. The Jr. 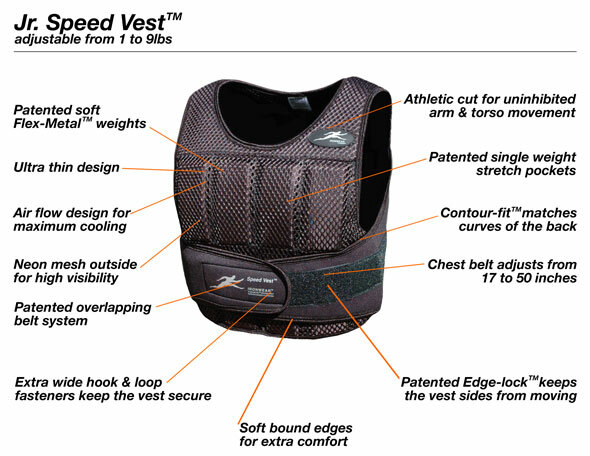 Speed Vest™ becomes one with an athletes torso and move with the athlete to provide resistance wanted wanted without unwanted shifting or interference. The Jr. Speed Suit™ Complete includes another IRONWEAR® creation. The Speed Pants™ are designed for use on the track or field for increasing leg strength, endurance, and foot speed. The Speed Pants™ are adjustable from 1 to 9 pounds with IRONWEAR®'s inner stretch opening pockets. The Speed Pants™ help to build explosive legs. The shell and the Flex-metal® weights conform to the shape of the athlete's thighs and waist without interfering with the athlete's motion. The Speed Pants™ are designed with an open center to help keep the athlete cool by allowing air to flow between the athlete's legs. The Speed Pants™ have multiple adjustments to adjust the position of the weights on the athlete's thighs and to adjust the tension on the thighs. Thigh pressure can be adjusted quickly without removing the Speed Pants™ or released completely to give your legs a rest. 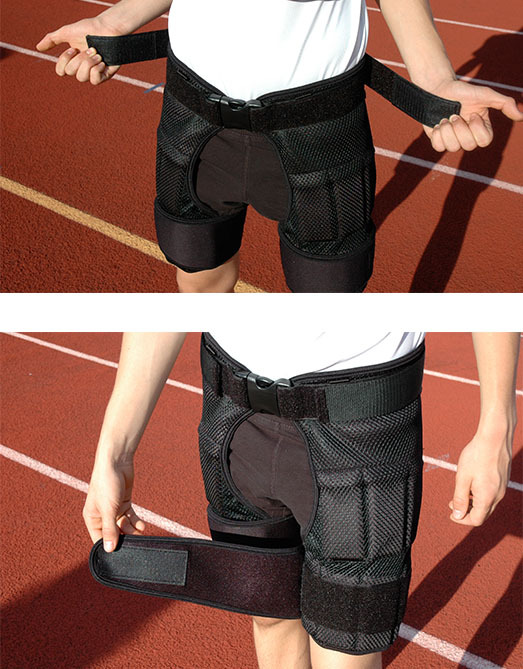 The double locking belts hold all the edges of the Speed Pants™ in place no matter how the athlete moves or kicks. The Speed Pant™'s large hole black mesh design does not show dirt, breathes, and is easy to clean. The Speed Pants™ fit a wide range of waist sizes from 22 inches to over 50 inches and can be easily worn over short or long pants. The thin design fits easily under most sweats and is an ideal tool for any athlete in any season. The Jr. Speed Suit™ Complete includes IRONWEAR®'s proprietary new Speed Shoe Irons™ developed over years of training olympic sprinters. The new Speed Shoe Irons™ includes both a removable/replaceable sole strap system and an adjustable heel strap for extra security for sprinting. IRONWEAR® created the Speed Shoe Irons™ to go overtop the athlete's shoes to provide resistance without interfering with the athlete's motion. The New Speed Shoe Irons™ are designed to improve foot speed, increase step height, and leg strength. IRONWEAR®'s proprietary design positions the weights evenly over the top of the foot just above the ball of the athlete's foot. 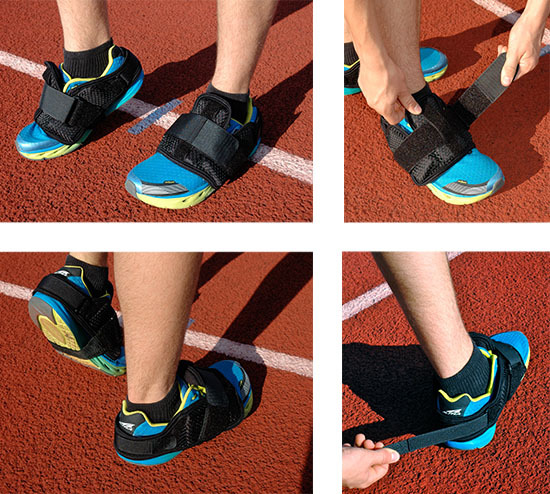 The system locks around the heel and under the arch to prevent any movement. Unlike ankle weights which move up and down on the ankle as you run, there is no sliding or jarring action with the New Speed Shoe Irons™. Because the weight is situated above the ball of the foot the weights and the foot impact the ground at the same time. The New Speed Shoe Irons™ have a bottom strap that is removable so that when it becomes worn it can easily be replaced. The multiple adjustments allow the new Speed Shoe Irons™ to fit a wide range of athletic shoe sizes and designs from a women's size 5 to a men's size 15. The Jr. Speed Suit™ Complete with Jr. Speed Vest™, Speed Pants™, and new Speed Shoe Irons™ is the ultimate training tool for the developing athlete for track and field sports, basketball, soccer, baseball or volleyball. It is adjustable from 1 to 21 pounds and is supplied with 42 1/2 pound Flex-metal® weights.